I can’t believe it! One whole year of blogging has just flown by. Yes, last August 8th, I tentatively made my very first post for Asian Inspired Hummus. It took me days to plan it, photograph it and write it up. I agonized over every detail, and the excitement I felt when I first clicked “Publish” was indescribable. My goal was to publish one recipe per week for the whole year and then re-assess where I would go from there. Well, I’m proud to say that I have met that goal, and then some. But as it turns out, I have learned that blogging is much more than just posting one recipe per week. I have entered a whole new community of talented, worldly, kind, and supportive bloggers; people who are passionate about their subject matter, and willing to share their experiences in the blogosphere. I have overcome my fear of writing publicly, I have honed my photography and food styling skills and I have discovered whole new areas of the food world that I can’t wait to explore. An excitement about cooking new things has crept into me: I find myself evolving as a cook. In the end, I have learned that no matter what the nay-sayers think, blogging allows us to reach deep inside and pull out the creativity that resides within us. It allows us to speak, contribute, discuss and to create the kind of world we want to inhabit. I have found it to be a deeply satisfying extension of myself, and something to celebrate! So my friends, here’s to another year! Thanks so much for your kindness, your support and for your willingness to share your passions. I celebrate this with you because one of the most important things I have learned about blogging, is that we do not do this in isolation – we do it with our community. This has been a great year and I really look forward to the next one! So, to honour this occasion, I have made a cake! No, not really. Cake making skills are something I will have to work on, but I have made my kind of dessert. I have been eyeing this recipe from Taste Magazine, for months and thought it would be perfect for today. 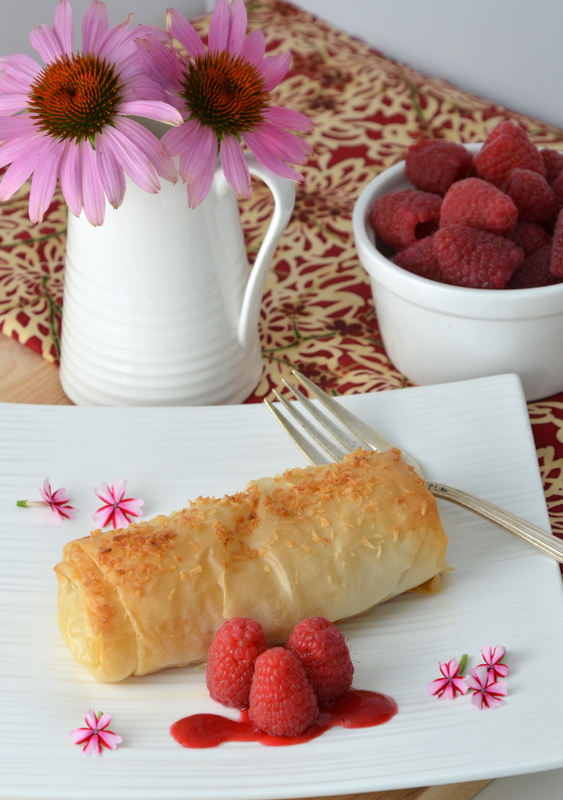 Creamy coconut rice pudding with dried apricots, enveloped in a crunchy, buttery phyllo pastry, accented with a tangy, fresh raspberry sauce: now this is something to celebrate with! I will also be bringing it to Fiesta Friday, my favourite event in the blogosphere! Thanks again to our host Angie @ The Novice Gardener, for giving us this space to socialize in and to our co-hosts for tending to this excitable crowd that continues to grow each week. In a small pot, stir together raspberries, sugar and lemon juice over medium heat. Cook until raspberries start to release their juices and break down, about 5 minutes. Do a taste test. If too tart, add more sugar and cook until dissolved. Place sauce in blender and puree until smooth. Strain sauce through a fine mesh sieve. Discard solids and refrigerate until ready to use. Can be stored in an airtight container in the fridge for up to 4 days. In a pot, stir together rice, coconut milk, sugar, vanilla bean, lemongrass, ginger and salt over medium-high heat. Bring to a boil, then reduce to simmer. Cover pot and cook, stirring occasionally, until rice is tender and pudding has thickened slightly, about 30 – 35 minutes. Transfer rice pudding to a bowl. Discard vanilla bean and lemongrass, and stir in apricots. Cover and refrigerate until cold, about 1 hour. Place ¾ cup grated coconut on a parchment-lined baking sheet and bake, stirring once, until golden, 5 – 8 minutes. Set aside to cool. 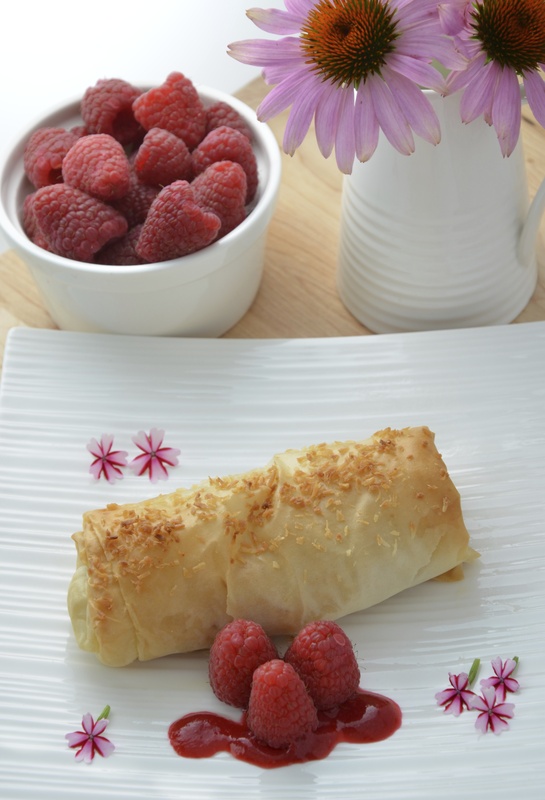 Gently unroll phyllo sheets and place on kitchen towel or sheet or waxed paper. Cover with a damp towel to prevent drying out as you work. Lay one sheet of phyllo, long side facing you, on a dry, flat surface. Brush evenly with a light coat of melted butter and fold in half lenghthwise. Brush lightly again with melted butter and sprinkle with 1 tablespoon of the toasted coconut. Spoon 3 tablespoons of the rice pudding along the middle of the side closest to you. Gently start to roll up the dough around pudding. Fold in sides over filling and continue to roll up dough to encase filling. Transfer spring rolls, seam side down to a parchment-lined baking sheet and top with more butter. Sprinkle with the remaining non-toasted coconut and bake until golden brown and rice pudding is warmed through, 20 -25 minutes. 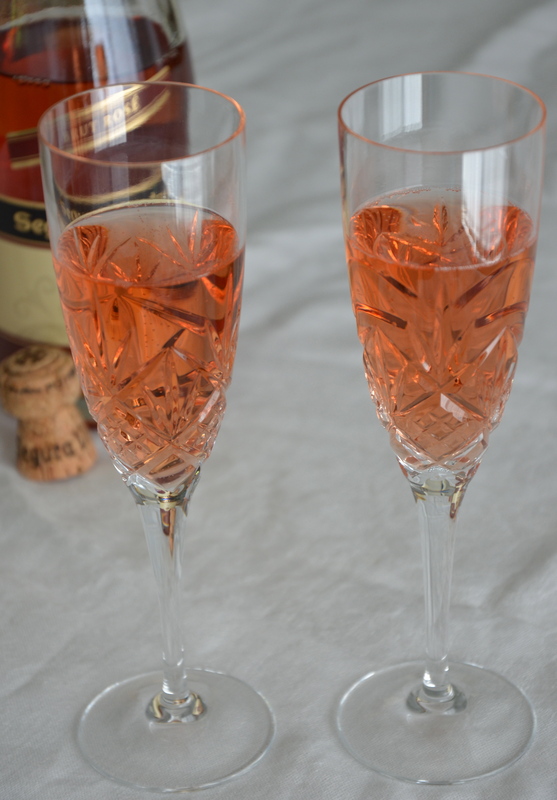 Serve with raspberry sauce and garnish with raspberries. Happy First Blogoversary to Foodie On Board! A Huge Thanks to Marielle @ Miss Beretta Illustration! Wowww😊!! This is so yummm!! A big congratzz for your blogiversary😊!! All the very best to your blog.. Let it cherish with lot of yummy posts.. Wow!!! Happy Happy Anniversary dear Julianna! You are such a blessing in the foodie blogosphere! One year! Wow!! Happy Blogoversary, Julianna! And oh my gosh, those coconut rice pudding spring rolls look so amazing. I want one now, and it’s almost 1 in the morning here. lol. I’ll have to make these as soon as possible! Happy blogiversary Julianna. …heavenly and creative treat to celebrate with…..just gorgeous. …All the very best keep rocking. ..
Oh Julianna, here’s cheers to you and to Foodie on Board! Congrats on your 1st year. 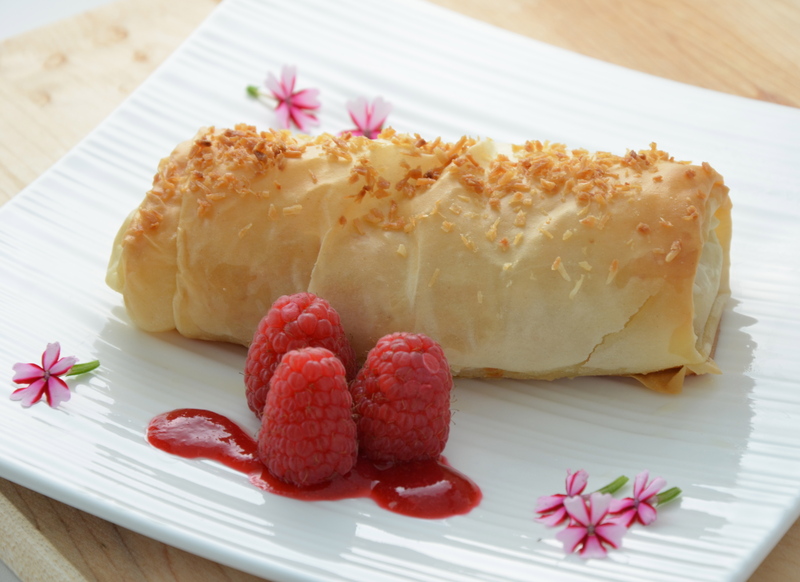 What a beautiful dessert to make to celebrate… looks stunning and I love the sound of those flavours – coconut… lemongrass…ginger… vanilla… all wrapped up in a crispy filo roll! Bookmarked for sometime soon. 🙂 Happy FF#28! Congratulations on completing one year of blogging. You are so right about the blogging experience, all those spin-offs we don’t anticipate until we get going. I look forward to your next year and beyond. Oh, my. This recipe sounds heavenly. Congratulations on your blogoversary – I totally dropped the ball on mine. As for overcoming your fear of writing publicly, I second that. Blogging has helped tremendously. 🙂 Cheers to us both! Congratulations !!! and I see the wonderful celebration 🙂 Cheers !!! Happy Blogoversary! The dish looks amazing! Congratulations on your Blogoversary. What a superb job! Congrats on your blogoversary! I love the homemade raspberry sauce to complement the spring roll. Have a wonderful weekend, and happy FF! I love how much the community aspect means to you – totally agree with you. Blogging is incredibly sociable. Have a great weekend, Cheers Julianna! Well, thanks so much Lily! I appreciate your support! Such a marvel these spring rolls are! And congratulations on your first year of sharing top-notch posts! Yum. Keep up the great work. This spring roll sounds very delightful… that is why you picked it for your special celebration. Yum! Congratulations on the anniversary, what a way to celebrate. Love your rolls, they not only look beautiful but they sound so delicious! Congratulations on the blog anniversary, Julianna! Delightful recipe… I like rice pudding and I like spring rolls and combining both sounds amazing! Congratulations on your anniversary! It is uncanny how you care for your blogging friends! I never thought of this aspect when I got started, but I sure appreciate it! Your recipe is so unique. It amazes me how people come up with some recipes. I’m inspired! Oh thanks! Me too! I never had nay idea about the social aspect of blogging when I first started. For that matter, I don’t think I ever check my notifications for about 5 months. I didn’t know that they existed! Congratulations on your first Blogiversary. The pictures you’ve shared are lovely. I wish you a happy blogging in your second year! Happy blogiversary!! I love what you chose to celebrate with, such a unique idea and looks so yummy! My lovely Julianna…. Happy, Happy, Happy Blogiversary… I’m so happy for you, and all that you’ve accomplished! Your hard work shows in everything that you do…. and I, with so many other bloggers, know all too well that feeling when you hit that “publish” button for the first time. You couldn’t have picked a better dessert to share with us on your first anniversary. I can see why you chose this one…. it’s absolutely perfect. Stunning an delicious. Congrats on your one year anniversary, Julianna! I am so glad to have encountered your blog and gotten to know your cooking style. It is a style I much admire and love to replicate. Here’s to many more years of happy blogging! The dessert looks delicious! These looks so pretty! Congratulations on your one year anniversary!!! Well, thanks so much! We gobbled up all of these spring rolls, so I think they must have been pretty tasty! A fun way to celebrate!